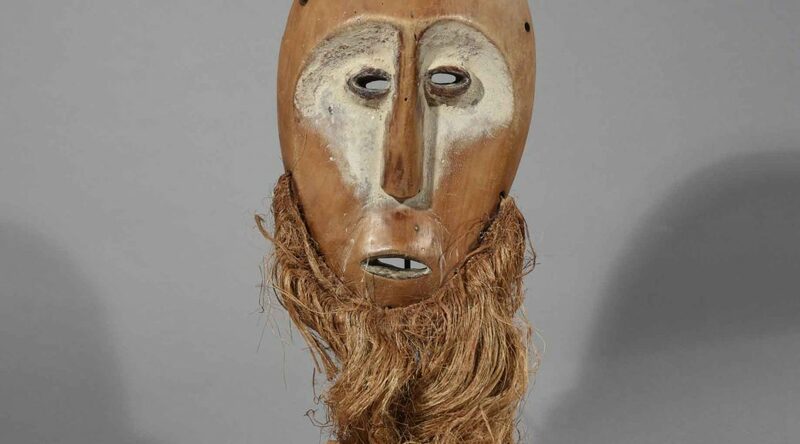 This is an unusual, utilised and well carved Bwami mask, Lega created in a light type of wood in a distinctive style, with a heart-shaped concave face, slightly protruding forehead, a narrow nose and fine attached beard. The faces of these type of masks are rubbed with white clay (pembe) each time they are used and thereby acquire the white patina that colours the face and enhances the various decorative designs. The Lega people live near the northern end of Lake Tanganyika on the banks of the Lualaba River and are also known as the Warega. Living in small village groups they have no centralized authority but govern themselves through a communal association known as “Bwami.” This association is composed of male and female members who strive to achieve advancement in the various ranks of Bwami. For Lega the ultimate goal is to reach the uppermost level of “Bwami” when one would become a “Kindi,” one who exercises moral influence within society. The complex system of instruction, initiation and advancement in Bwami uses masks and figures to document the various levels of Bwami and to serve as badges validating the initiate’s knowledge of the secrets of Bwami and of their rank. Initiates earn the privilege to wear and display masks, which might be worn on their arms or faces or simply exposed on racks or on the ground in front of its owners’ hut. Age: Age Mid. 20th century. Provenance: Acquired at Dutch auction, ex private collection of A. Wiket, Belgium.